The primary mission of AirSafe.com is to provide airline passengers and aviation professionals with reliable information about plane crashes and other issues or events related to aviation safety and aviation security. AirSafe.com and the AirSafe.com Foundation can't do this alone. They both rely on publicly available information for news events like recent crashes and for reliable data for determining things like fatal event rates for aircraft models. Some data, like plane crashes and accident investigation reports, are very easy to find, often widely publicized, and sometimes published by authoritative sources like government agencies. Other data, for example the number of airplane flights for a particular model, are much harder to find. One of the best sources for information about accident rates for specific airline models is an annual publication from Boeing, the Statistical Summary of Commercial Airplane Accidents. 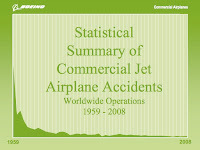 The newest edition, covering 2008, was published in July 2009, and it provides a summary of last year's accidents as well as comparative data on the accident rates of various aircraft models. Some of the key data from this publication is included within AirSafe.com, especially the Fatal Events by Aircraft Model page. Boeing's Statistical Summary is one of the industry publications that has very high quality data, and should be consulted by anyone who has an interest in airline safety, especially to answer specific questions about airliner accident rates and how they have changed over the last several decades. You can download the most recent edition which covers 2008, and the previous one covering 2007 below. If you have an interest in how data like this is used to answer complex aviation risk and safety questions, you can also download two resources from AirSafe.com: selected portions of the book Understanding Aviation Safety Data from AirSafe.com founder Dr. Todd Curtis, or you can register for the free online class on how to systematically ask and answer an aviation safety question.